Level Up Your Suite Pics! Having great photos are essential to showcasing your properties for rent. Photos can sometimes mean the difference between a prospect coming to see your property versus outright ignoring your listings in favour of a competitor. Most people are visual and the first thing that they look for when viewing an ad, whether on a Listing Service or your own website, are the photos. Bad photos can ruin the best descriptions and cause a prospect to skip over their perfect unit! We understand the importance of photos and have been working towards improving your experience with managing photos within our platforms. We know that rental prospects want to see specific photos of the units they could be leasing. 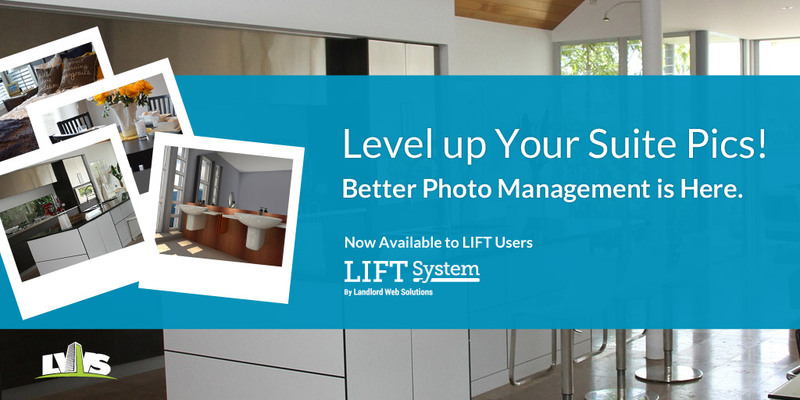 The team at LWS is very excited to announce that we have just released a major upgrade to our Photo Management tools! Available to all customers using the LIFT System. You can login right now to start taking advantage of the new features. Find out how you can take advantage of our new feature! Sign Up today to have your website added to the queue of site installs. And even more thrilling, is the release of a Suites Photo Manager! Allowing you to upload photos for specific suites or suite types. Gives you the ability to upload all photos to a property, where you can swap or re-assign at any time. Upload and assign photos from the property's library to specific suites. Multiple suites can share the same photo. The new multi-uploader for managing existing & new photos is available immediately to start using. We are opening the Suite Photo Manager for all customers for a two week period before anything is impacted. Website installs will commence on August 9th, two weeks after launch. If you want to include suite specific photos on your website, please see a link at the bottom of this post to add your website to this list of installs. There will be a small cost to have a designer and a programmer implement this feature on your website. Costs may vary depending on complexity. The basic installations will be less than $500. Furthermore, suite specific photos will not take effect in RentSync until September 19th; four weeks after the initial launch. Suite Photos in RentSync is available at no additional costs. All you need to do is start uploading your photos to suites and on August 22nd your ads will start using suite specific photos for all connections that support them. More information regarding the supported connections will be revealed in the coming weeks. This two week window allows you to interact and try out the new feature. Evaluate whether you want to take advantage of this feature without having to incur any costs or make undesired changes to your advertisements. You can start gathering your suite photos and uploading them without any worry, we'll be happy to review if you have any concerns about how they will appear. The rate at which you start using this feature is completely up to you. You may use it for as many or as little properties & suites as you'd like. If you do not want to manage photos on a suite level, there is nothing you need to do. You may cycle back to this in the future if you change your mind. July 26th - August 6th: Try out, learn and determine if you want to use this feature. August 9th: Website installs will start taking place. See the bottom of this post to add your company's website to the list. September 26th: RentSync ads starts to include Suite Photos for supported connections. Property photos remain working exactly how they do now. Generally a photo gallery or a wide rotating photo banner on the details page of a property. Nothing will change about your website around the main property photo galleries. For Suite Photos, the default or basic functionality will be having unique galleries for each individual suite listed that pop when a 'Photos' link or icon is clicked. All the photos that belong to a suite will be shown in the gallery. If your website is grouping suites together when listing suites, for example combining all One Bedroom suites in LIFT together to show only one entry of One Bedroom instead of several, it will combine all the suite photos together and de-duplicate them all so only unique photos are included. This is the default behaviour and can be changed upon request. The behaviour on RentSync will slightly vary based a number of things, such as does the connection support suite specific photos, or whether you are creating one ad for each suite type or unique ads for each individual suite. If you have no photos assigned to a suite, then the ads will show all the property level photos. Exactly how it works now. It's important to note that once a suite starts using Suite Photos, meaning as soon as the first photo is added the behaviour shifts to using Suite Photos instead of the building photos. You'll be able to have complete control over what photos appear in your ads for the supported connections. You should be assigning exterior and neighbourhood photos to suites mixed in with the suite specific photos to create the optimal gallery on ads generated from RentSync. On websites, any property level photos that are assigned in a suite will be de-duplicated in the suites gallery by default. This is so you can control the exact order in which all your photos appear in your ads. We are working to ensure that this operates optimally for each connection. More information around how each connection will work will be revealed in the coming weeks. Want to include Suite Photos on your website?